Stucco aluminium sheet suppliers manufacturing high quality aluminium stucco sheet applied in high-end refrigerator, freezer interior material, cold room, freezer interior materials and packaging industry. The common seen stucco aluminum sheet 1100 3003 5052 product has the surface pattern as classic and variation orange peel. The stucco embossed aluminum sheet used in the refrigerator evaporator belongs to the orange peel stucco aluminum sheet, and it is processed by the aluminum sheet roll subjected to pressure processing to form a pattern similar to the orange peel on the surface. At present, the thickness of orange peel stucco aluminium sheet coil produced by Haomei is between 0.2mm-1.0mm and the width is usually 1000mm. The alloy of stucco embossed aluminium sheet are 1050, 1060, 1070, 1100, 3003 and 5052. The orange peel aluminium stucco sheet coil is usually used in refrigerators, air conditioners and other refrigeration equipment and pipe insulation. The series products have good heat conduction and heat dissipation performance due to the particularity of the pattern. 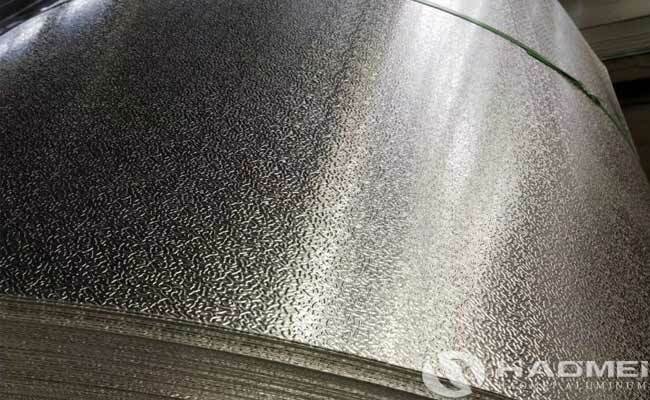 In addition to refrigeration equipment, as one of the top stucco aluminium sheet suppliers in China, Haomei aluminum also offer embossed aluminum products used for decoration, furniture, luggage, etc., even in the current large aircraft production, mechanical parts processing, mold making, chemical insulation pipe coating and other industries.